How green is our Valley?? I love springtime in Arbon! The deep green of the fall wheat in contrast with the bitter-sweet chocolate brown of the fresh plowed fields makes me want to mimic it in a quilt for my bed. There are occasional patches of last years stubble fields adding two-toned, diagonal stripes of beige to the landscape. Then there are the areas where seeds have had to be replanted because of our long winter. It looks as though a creek has carved crazily curving canyons of brown through the otherwise verdant green. To add texture to the crazy quilt we have long abandoned sheds which have stood against the years of endless wind but are now leaning closer and closer to the ground from which the wood boards of which they are built once sprung. They only time they hear the voice of human companionship when engaged couples come to take pictures for their wedding announcements. A small flock of pelicans, presumably on their way to American Falls Reservoir, found a weekend refuge in the flooded meadow north of Ardean Andersen’s home. A few friendly cranes joined them at their temporary bed and breakfast. y closest neighbors are a large herd of Black Angus cows. Because they are about all I have to look at through my kitchen window I have become fascinated at some of their behaviors. The first morning after they were moved out onto this grazing range they still came down to the entry gate and stood waiting for the truck to bring them their breakfast. 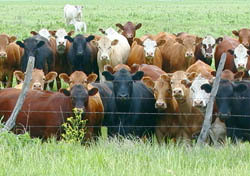 I understood then what my neighbor meant when he referred to them as “welfare cows”. Even though they are standing in an extensive field of green feed, they still want the truck with the old dry hay to come feed them because it is what they are used to and it is so much less work for them. This was even more evident the next morning. I watched as cow after cow strode rather quickly to join the mass of black bovines who stood bawling at an old derelict truck. This truck, which vaguely resembles the truck that used to bring them their feed has been rusting away in the same place for more than 20 years. No matter how long they stood there bawling and complaining, that old truck never brought them their meal. I was driving into work the other morning about 7:30 am and I noticed a bird in the road up ahead. I normally don’t slow down for birds unless they are fairly large ones like an eagle or a buzzard. I figure they have wings and much greater maneuverability than I have so I feel it’s up to them to get out of my way not the other way around. 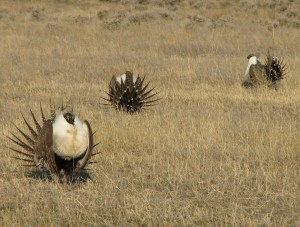 As I got closer I realized it was a pair of sage grouse participating in their courtship ritual. [I recognized it from a wildlife documentary.] The rooster was performing his fan dance right there in the middle of the road while the object of his affections was sitting at the very edge of the pavement in rapt attention. I breezed through them at about 50 miles per hour and neither one of them flinched or flew. I doubt they even noticed I had gone by. Hmmmmm…. I think I may have just figured out why they are almost on the endangered species list.